For other people named Walter Raleigh, see Walter Raleigh (disambiguation). Sir Walter Raleigh (/ˈrɔːli, ˈræli, ˈrɑːli/; c. 1552 (or 1554) – 29 October 1618), also spelled Ralegh, was an English landed gentleman, writer, poet, soldier, politician, courtier, spy and explorer. He was cousin to Sir Richard Grenville and younger half-brother of Sir Humphrey Gilbert. He is also well known for popularising tobacco in England. Raleigh was one of the most notable figures of the Elizabethan era. Little is known about Raleigh's birth but he is believed to have been born on 22 January 1552 (or possibly 1554, according to the Oxford Dictionary of National Biography). He grew up in the house of Hayes Barton, in the parish of East Budleigh in South Devon. He was the youngest of the five sons of Walter Raleigh (1510–1581) (or Rawleigh) of Fardel Manor in the parish of Cornwood, in South Devon. His family is generally assumed to have been a junior branch of the de Raleigh family, 11th century lords of the manor of Raleigh, Pilton in North Devon, although the two branches are known to have borne entirely dissimilar coats of arms, adopted at the start of the age of heraldry (c.1200-1215). His mother was Katherine Champernowne, his father's 3rd wife, the 4th daughter of Sir Philip Champernowne (1479-1545), lord of the manor of Modbury, Devon, by his wife Catherine Carew, a daughter of Sir Edmund Carew (d.1513) of Mohuns Ottery in the parish of Luppitt, Devon, and widow of Otes Gilbert (1513-1546/7) of Greenway in the parish of Brixham and of Compton Castle in the parish of Marldon, both in Devon. Katherine Champernowne's paternal aunt was Kat Ashley, governess of Queen Elizabeth I, who introduced the young men at court. The coat of arms of Otes Gilbert and Katherine Champernowne survives in a stained glass window in Churston Ferrers Church, near Greenway. Sir Walter's half-brothers John Gilbert, Humphrey Gilbert, and Adrian Gilbert, and his full brother Carew Raleigh were also prominent during the reigns of Queen Elizabeth I and King James I.
Raleigh's family was highly Protestant in religious orientation and had a number of near escapes during the reign of Roman Catholic Queen Mary I of England. In the most notable of these, his father had to hide in a tower to avoid execution. As a result, Raleigh developed a hatred of Roman Catholicism during his childhood, and proved himself quick to express it after Protestant Queen Elizabeth I came to the throne in 1558. In matters of religion, Elizabeth was more moderate than her half sister Mary. In 1569, Raleigh left for France to serve with the Huguenots in the French religious civil wars. In 1572, Raleigh was registered as an undergraduate at Oriel College, Oxford, but he left a year later without a degree. Raleigh proceeded to finish his education in the Inns of Court. In 1575, he was registered at the Middle Temple. At his trial in 1603, he stated that he had never studied law. His life is uncertain between 1569 and 1575, but in his History of the World he claimed to have been an eyewitness at the Battle of Moncontour (3 October 1569) in France. In 1575 or 1576, Raleigh returned to England. Between 1579 and 1583, Raleigh took part in the suppression of the Desmond Rebellions. He was present at the Siege of Smerwick, where he led the party that beheaded some 600 Spanish and Italian soldiers. Raleigh received 40,000 acres (16,000 ha) (approx. 0.2% of Ireland) upon the seizure and distribution of land following the attainders arising from the rebellion, including the coastal walled town of Youghal and, further up the Blackwater River, the village of Lismore. This made him one of the principal landowners in Munster, but he had limited success inducing English tenants to settle on his estates. Raleigh made the town of Youghal his occasional home during his 17 years as an Irish landlord, frequently being domiciled at Killua Castle, Clonmellon, County Westmeath. He was mayor there from 1588 to 1589. His town mansion of Myrtle Grove is assumed to be the setting for the story that his servant doused him with a bucket of water after seeing clouds of smoke coming from Raleigh's pipe, in the belief that he had been set alight. But this story is also told of other places associated with Raleigh: the Virginia Ash Inn in Henstridge near Sherborne, Sherborne Castle, and South Wraxall Manor in Wiltshire, home of Raleigh's friend Sir Walter Long. Amongst Raleigh's acquaintances in Munster was another Englishman who had been granted land there, poet Edmund Spenser. 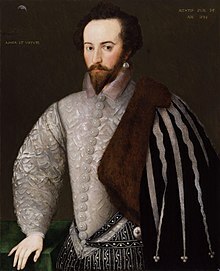 In the 1590s, he and Raleigh travelled together from Ireland to the court at London, where Spenser presented part of his allegorical poem The Faerie Queene to Elizabeth I.
Raleigh's management of his Irish estates ran into difficulties which contributed to a decline in his fortunes. In 1602, he sold the lands to Richard Boyle, 1st Earl of Cork, who subsequently prospered under kings James I and Charles I. Following Raleigh's death, members of his family approached Boyle for compensation on the ground that Raleigh had struck an improvident bargain. In 1584, Queen Elizabeth granted Raleigh a royal charter authorising him to explore, colonise and rule any "remote, heathen and barbarous lands, countries and territories, not actually possessed of any Christian Prince or inhabited by Christian People," in return for one-fifth of all the gold and silver that might be mined there. This charter specified that Raleigh had seven years in which to establish a settlement, or else lose his right to do so. Raleigh and Elizabeth intended that the venture should provide riches from the New World and a base from which to send privateers on raids against the treasure fleets of Spain. Raleigh himself never visited North America, although he led expeditions in 1595 and 1617 to the Orinoco River basin in South America in search of the golden city of El Dorado. Instead, he sent others in 1585 to found the Roanoke Colony, later known as the "Lost Colony". When the supply ship arrived in Roanoke, three years later than planned, the colonists had disappeared. :130–33 The only clue to their fate was the word "CROATOAN" and letters "CRO" carved into tree trunks. White had arranged with the settlers that if they should move, the name of their destination be carved into a tree or corner post. This suggested the possibilities that they had moved to Croatoan Island, but a hurricane prevented John White from investigating the island for survivors. :130–33 Other speculation includes their having starved, or been swept away or lost at sea during the stormy weather of 1588. No further attempts at contact were recorded for some years. Whatever the fate of the settlers, the settlement is now remembered as the "Lost Colony of Roanoke Island". In December 1581, Raleigh returned to England from Ireland as his company had been disbanded. He took part in court life and became a favourite of Queen Elizabeth I because of his efforts at increasing the Protestant Church in Ireland. In 1585, Raleigh was knighted and was appointed warden of the stannaries, that is of the tin mines of Cornwall and Devon, Lord Lieutenant of Cornwall, and vice-admiral of the two counties. He sat in parliament as member for Devonshire in 1585 and 1586. He was also granted the right to colonise America. Raleigh commissioned shipbuilder R. Chapman of Deptford to build a ship for him. It was originally called Ark but became Ark Raleigh, following the convention at the time by which the ship bore the name of its owner. The Crown (in the person of Queen Elizabeth I) purchased the ship from Raleigh in January 1587 for £5,000 (£1,100,000 as of 2015). This took the form of a reduction in the sum that Sir Walter owed the queen; he received Exchequer tallies but no money. As a result, the ship was renamed Ark Royal. In 1592, Raleigh was given many rewards by the Queen, including Durham House in the Strand and the estate of Sherborne, Dorset. He was appointed Captain of the Yeomen of the Guard. However, he had not been given any of the great offices of state. In the Armada year of 1588, Raleigh had some involvement with defence against the Spanish at Devon. His ship, the Ark Raleigh, was Lord High Admiral Howard's flagship. In 1591, Raleigh was secretly married to Elizabeth "Bess" Throckmorton (or Throgmorton). She was one of the Queen's ladies-in-waiting, 11 years his junior, and was pregnant at the time. She gave birth to a son, believed to be named Damerei, who was given to a wet nurse at Durham House, but he died in October 1592 of plague. Bess resumed her duties to the queen. The following year, the unauthorised marriage was discovered and the Queen ordered Raleigh to be imprisoned and Bess dismissed from court. Both were imprisoned in the Tower of London in June 1592. He was released from prison in August 1592 to manage a recently returned expedition and attack on the Spanish coast. The fleet was recalled by the Queen, but not before it captured an incredibly rich prize— a merchant ship (carrack) named Madre de Deus (Mother of God) off Flores. Raleigh was sent to organise and divide the spoils of the ship. He was sent back to the Tower, but by early 1593 had been released and become a member of Parliament. It was several years before Raleigh returned to favour, and he travelled extensively in this time. Raleigh and his wife remained devoted to each other. They had two more sons, Walter (known as Wat) and Carew. Raleigh was elected a burgess of Mitchell, Cornwall, in the parliament of 1593. He retired to his estate at Sherborne, where he built a new house, completed in 1594, known then as Sherborne Lodge. Since extended, it is now known as Sherborne New Castle. He made friends with the local gentry, such as Sir Ralph Horsey of Clifton Maybank and Charles Thynne of Longleat. During this period at a dinner party at Horsey's, Raleigh had a heated discussion about religion with Reverend Ralph Ironsides. The argument later gave rise to charges of atheism against Raleigh, though the charges were dismissed. He was elected to Parliament, speaking on religious and naval matters. In 1594, he came into possession of a Spanish account of a great golden city at the headwaters of the Caroní River. A year later, he explored what is now Guyana and eastern Venezuela in search of Lake Parime and Manoa, the legendary city. Once back in England, he published The Discovery of Guiana (1596), an account of his voyage which made exaggerated claims as to what had been discovered. The book can be seen as a contribution to the El Dorado legend. Venezuela has gold deposits, but no evidence indicates that Raleigh found any mines. He is sometimes said to have discovered Angel Falls, but these claims are considered far-fetched. In 1596, Raleigh took part in the Capture of Cadiz, where he was wounded. He also served as the rear admiral (a principal command) of the Islands Voyage to the Azores in 1597. On his return from the Azores, Raleigh helped England defend itself against the major threat of the 3rd Spanish Armada during the autumn of 1597. The Armada was dispersed in the Channel, and later was devastated by a storm off Ireland. Lord Howard of Effingham and Raleigh were able to organise a fleet that resulted in the capture of a Spanish ship in retreat carrying vital information regarding the Spanish plans. In 1597 Raleigh was chosen member of parliament for Dorset, and in 1601 for Cornwall. He was unique in the Elizabethan period in sitting for three counties. From 1600 to 1603, as governor of the Channel Island of Jersey, Raleigh modernised its defences. This included construction of a new fort protecting the approaches to Saint Helier, Fort Isabella Bellissima, or Elizabeth Castle. Royal favour with Queen Elizabeth had been restored by this time, but his good fortune did not last; the Queen died on 24 March 1603. Raleigh was arrested on 19 July 1603, charged with treason for his involvement in the Main Plot against Elizabeth's successor, James I, and imprisoned in the Tower of London. Raleigh's trial began on 17 November in the converted Great Hall of Winchester Castle. Raleigh conducted his own defence. The chief evidence against him was the signed and sworn confession of his friend Henry Brooke, 11th Baron Cobham. Raleigh repeatedly requested that Cobham be called to testify. "[Let] my accuser come face to face, and be deposed. Were the case but for a small copyhold, you would have witnesses or good proof to lead the jury to a verdict; and I am here for my life!" Raleigh argued that the evidence against him was "hearsay", but the tribunal refused to allow Cobham to testify and be cross-examined. Raleigh was convicted, but King James spared his life. He remained imprisoned in the Tower until 1616. While there, he wrote many treatises and the first volume of The Historie of the World (first edition published 1614) about the ancient history of Greece and Rome. His son, Carew, was conceived and born (1604) while Raleigh was imprisoned in the Tower. James I's royal warrant pardoning Raleigh in 1617. In 1617, Raleigh was pardoned by the King and granted permission to conduct a second expedition to Venezuela in search of El Dorado. During the expedition, a detachment of Raleigh's men under the command of his long-time friend Lawrence Keymis attacked the Spanish outpost of Santo Tomé de Guayana on the Orinoco River, in violation of peace treaties with Spain, and against Raleigh's orders. A condition of Raleigh's pardon was avoidance of any hostility against Spanish colonies or shipping. In the initial attack on the settlement, Raleigh's son, Walter, was fatally shot. Keymis informed Raleigh of his son's death and begged for forgiveness, but did not receive it, and at once committed suicide. On Raleigh's return to England, an outraged Count Gondomar, the Spanish ambassador, demanded that Raleigh's death sentence be reinstated by King James, who had little choice but to do so. Raleigh was brought to London from Plymouth by Sir Lewis Stukeley, where he passed up numerous opportunities to make an effective escape. Raleigh was beheaded in the Old Palace Yard at the Palace of Westminster on 29 October 1618. "Let us dispatch", he said to his executioner. "At this hour my ague comes upon me. I would not have my enemies think I quaked from fear." After he was allowed to see the axe that would be used to behead him, he mused: "This is a sharp Medicine, but it is a Physician for all diseases and miseries." According to biographers, Raleigh's last words (as he lay ready for the axe to fall) were: "Strike, man, strike!" Thomas Hariot may have introduced him to tobacco. Having been one of the people to popularise tobacco smoking in England, he left a small tobacco pouch, found in his cell shortly after his execution. Engraved upon the pouch was a Latin inscription: Comes meus fuit in illo miserrimo tempore ("It was my companion at that most miserable time"). Raleigh's head was embalmed and presented to his wife. His body was to be buried in the local church in Beddington, Surrey, the home of Lady Raleigh, but was finally laid to rest in St. Margaret's, Westminster, where his tomb may still be visited today. "The Lords", she wrote, "have given me his dead body, though they have denied me his life. God hold me in my wits." It has been said that Lady Raleigh kept her husband's head in a velvet bag until her death. After Raleigh's wife's death 29 years later, his head was returned to his tomb and interred at St. Margaret's Church. Although Raleigh's popularity had waned considerably since his Elizabethan heyday, his execution was seen by many, both at the time and since, as unnecessary and unjust, as for many years his involvement in the Main Plot seemed to have been limited to a meeting with Lord Cobham. One of the judges at his trial later said: "The justice of England has never been so degraded and injured as by the condemnation of the honourable Sir Walter Raleigh." While imprisoned in the Tower Raleigh wrote his incomplete "The Historie of the World." Using a wide array of sources in six languages, Raleigh was fully abreast of the latest continental scholarship. He wrote not about England, but of the ancient world with a heavy emphasis on geography. Despite his intention of providing current advice to the King of England, King James I complained that it was "too sawcie in censuring Princes." Raleigh's poetry is written in the relatively straightforward, unornamented mode known as the plain style. C. S. Lewis considered Raleigh one of the era's "silver poets", a group of writers who resisted the Italian Renaissance influence of dense classical reference and elaborate poetic devices. His writing contains strong personal treatments of themes such as love, loss, beauty, and time. Most of his poems are short lyrics that were inspired by actual events. In poems such as What is Our Life and The Lie, Raleigh expresses a contemptus mundi (contempt of the world) attitude more characteristic of the Middle Ages than of the dawning era of humanistic optimism. But his lesser-known long poem The Ocean's Love to Cynthia combines this vein with the more elaborate conceits associated with his contemporaries Edmund Spenser and John Donne, expressing a melancholy sense of history. The poem was written during his imprisonment in the Tower of London. Raleigh wrote a poetic response to Christopher Marlowe's The Passionate Shepherd to His Love of 1592, entitled The Nymph's Reply to the Shepherd. Both were written in the style of traditional pastoral poetry and follow the structure of six four-line stanzas employing a rhyme scheme of AABB, with Raleigh's an almost line-for-line refutation of Marlowe's sentiments. Years later, the 20th-century poet William Carlos Williams would join the poetic "argument" with his Raleigh was Right. "Conceit begotten by the Eyes"
"Epitaph on Sir Philip Sidney"
"Epitaph on the Earl of Leicester"
"His Petition to Queen Anne of Denmark"
"If Cynthia be a Queen"
"In Commendation of George Gascoigne's Steel Glass"
"My Body in the Walls captive"
"The Nymph's Reply to the Shepherd"
"On the Snuff of a Candle"
"The Ocean's Love to Cynthia"
"A Poem entreating of Sorrow"
"A Poem put into my Lady Laiton's Pocket"
"A Prognistication upon Cards and Dice"
"The Shepherd's Praise of Diana"
"To the Translator of Lucan's Pharsalia"
"The Wood, the Weed, the Wag"
In 1845, Shakespeare scholar Delia Bacon first proposed that a group of authors had actually written the plays later attributed to William Shakespeare, the main writer being Walter Raleigh. Later, George S. Caldwell asserted that Raleigh was actually the sole author. These claims have been supported by other scholars throughout subsequent years, including Albert J. Beveridge and Henry Pemberton, but are rejected by the majority of Shakespearean scholars today. In 2002, Raleigh was featured in the BBC poll of the 100 Greatest Britons. A galliard was composed in honour of Raleigh by either Francis Cutting or Richard Allison. The state capital of North Carolina, its second-largest city, was named Raleigh in 1792, after Sir Walter, sponsor of the Roanoke Colony. In the city, a bronze statue, which has been moved around different locations within the city, was cast in honour of the city's namesake. The "Lost Colony" is commemorated at the Fort Raleigh National Historic Site on Roanoke Island, North Carolina. One of 11 boarding houses at the Royal Hospital School has been named after Raleigh, as is one of the four nautically named Houses at the Preparatory School of Barnard Castle School. Raleigh County, West Virginia, is also named in his honour. Mount Raleigh in the Pacific Ranges of the Coast Mountains in British Columbia, Canada, was named for him, with related features the Raleigh Glacier and Raleigh Creek named in association with the mountain. Mount Gilbert, just to Mount Raleigh's south, was named for his half-brother, Sir Humphrey. Raleigh has been widely speculated to be responsible for introducing the potato to Europe, and was a key figure in bringing it to Ireland. However, modern historians dispute this claim, suggesting it would have been impossible for Raleigh to have discovered the potato in the places he visited. Due to Raleigh's role in the popularisation of smoking, John Lennon humorously referred to him as "such a stupid get" in the song "I'm So Tired" on the "White Album" The Beatles (1968). Various colourful stories are told about him, such as laying his cloak over a puddle for the Queen, but they are probably apocryphal. The author George Garrett's historical fiction novel Death of the Fox explores Raleigh's relationships with Elizabeth I and her successor James I. ^ "Sir Walter Raleigh". Nndb.com. Retrieved 20 March 2014. ^ Many alternative spellings of his surname exist, including Rawley, Ralegh, Ralagh, and Rawleigh. "Raleigh" appears most commonly today, though he used that spelling only once, as far as is known. His most consistent preference was for "Ralegh". His full name is /ˈwɔːltər ˈrɔːli/, though in practice /ˈræli/, RAL-ee, or even /ˈrɑːli/ RAH-lee are the usual modern pronunciations in England. ^ Ronald, Susan (2007) The Pirate Queen: Queen Elizabeth I, her Pirate Adventurers, and the Dawn of Empire Harper Collins Publishers, New York. ISBN 0-06-082066-7. p. 249. ^ Bremer, Francis J.; Webster, Tom (2006). Puritans and Puritanism in Europe and America. 1. Santa Barbara, California: ABC-CLIO Inc. p. 454. ^ Edwards, Edward (1868) The Life of Sir Walter Ralegh. Volume I. London: Macmillan, pp. 26, 33. ^ Saint-John, James Augustus. "Perpetrates the Massacre of Del Oro". Life of Sir Walter Raleigh: 1552 – 1618 : in two volumes, Volume 1. pp. 52–77. ^ Nicholls, Mark; Williams, Penry. "The Devon Man". Sir Walter Raleigh: In Life and Legend. p. 15. ISBN 978-1-4411-1209-5. ^ "Charter to Sir Walter Raleigh: 1584". The Avalon Project. Yale Law School, Lillian Goldman Law Library. Retrieved 14 June 2015. ^ Blacker, Irwin (1965). Hakluyt's Voyages: The Principle Navigations Voyages Traffiques & Discoveries of the English Nation. New York: The Viking Press. p. 522. ^ a b c d Quinn, David B. (February 1985). Set Fair for Roanoke: Voyages and Colonies, 1584–1606. UNC Press Books. ISBN 978-0-8078-4123-5. Retrieved 3 June 2011. ^ a b Walter Raleigh Biography. The Biography Channel website. 2014. 12 March 2014. ^ May, Steven W. (1989). Sir Walter Ralegh. Boston, MA: G.K. Hall & Co. p. 8. ISBN 9780805769838. ^ Sir Walter Raleigh. The Discovery of Guiana Project Gutenberg. ^ "Walter Raleigh – Delusions of Guiana". The Lost World: The Gran Sabana, Canaima National Park and Angel Falls – Venezuela. Archived from the original on 9 February 2012. Retrieved 22 May 2015. ^ 1 Criminal Trials 400, 400–511, 1850. ^ Raleigh, Walter. "The Historie of the World". Retrieved 19 November 2009. ^ Lee, Sidney, ed. (1898). "Stucley, Lewis" . Dictionary of National Biography. 55. London: Smith, Elder & Co.
^ Gene Borio. "Tobacco Timeline: The Seventeenth Century-The Great Age of the Pipe". Tobacco.org. Retrieved 29 October 2012. 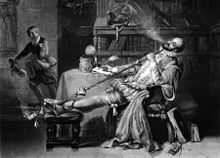 ^ "Sir Walter Raleigh's tobacco pouch". Wallace Collection. Retrieved 1 November 2012. ^ Brushfield, Thomas Nadauld (1896). Raleghana. 8. ^ "Crawford v. Washington" (PDF). p. 44. Retrieved 25 April 2017. ^ Nicholas Popper, Walter Ralegh's "History of the World" and the Historical Culture of the Late Renaissance (2012) p 18. ^ J. Racin, Sir Walter Raleigh as Historian (1974). ^ "Notes for The Passionate Shepherd to His Love". Dr. Bruce Magee, Louisiana Tech University. Retrieved 29 October 2012. ^ "As ye came from the holy land" is often attributed to Raleigh, but, in the words of Gerald Bullett, "it certainly existed before Ralegh arrived on the scene; Ralegh's connexion with it is largely a matter of conjecture": Bullett, Gerald (1947). Silver Poets of the 16th Century. Everyman's Library. 1985. London: Dent. p. 280. ^ Walter Raleigh Wrote Shakespeare? ^ "Mathew Holmes lute books: Sir Walter Raleigh's galliard". Cambridge Digital Library. Retrieved 11 December 2014. ^ "The Lost Colony pageant"
^ "Raleigh County history sources". West Virginia Division of Culture and History. Archived from the original on 29 October 2013. Retrieved 30 May 2015. ^ Salaman, Redcliffe N (1985). Burton, William Glynn; Hawkes, J. G. (eds.). The History and Social Influence of the Potato. Cambridge University Press Library Editions. p. 148. ISBN 978-0-5213-1623-1. ^ Naunton, Robert Fragmenta Regalia 1694, reprinted 1824. Beer, Anna Sir Walter Raleigh and his readers in the Seventeenth Century (Springer, 1997). Lewis, C. S. English Literature in the Sixteenth Century Excluding Drama, (1954). Hiscock, Andrew. "Walter Ralegh and the Arts of Memory." Literature Compass 4.4 (2007): 1030–1058. Holmes, John. "The Guiana Projects: Imperial and Colonial Ideologies in Ralegh and Purchas." Literature & History 14.2 (2005): 1–13. Lyons, Mathew. The Favourite: Ralegh and His Queen (Hachette UK, 2011). May, Steven W. Sir Walter Ralegh (Twayne Pub, 1989). Raleigh as a writer and poet. Nicholls, Mark and Williams, Penry. ‘Ralegh, Sir Walter (1554–1618)’, Oxford Dictionary of National Biography, Oxford University Press, 2004. Lawson-Peebles, Robert. "The many faces of Sir Walter Ralegh" History Today 48.3 (1998): 17+. Nicholls, Mark, and Penry Williams. Sir Walter Raleigh: In Life and Legend (Bloomsbury Publishing, 2011). Popper, Nicholas. Walter Ralegh's " History of the World" and the historical culture of the late Renaissance (U of Chicago Press, 2012). Ralegh, Sir Walter, and Michael Rudick. "The Poems of Sir Walter Ralegh: A Historical Edition." (Arizona Center for Medieval and Renaissance Studies/Renaissance English Text Society, 1999). Wikimedia Commons has media related to Sir Walter Raleigh. Tytler, Patrick Fraser (1848). "Life of Sir Walter Raleigh, Founded on Authentic and Original Documents". London: T. Nelson and Sons (published 1853). Retrieved 17 August 2008.